Lock in a great price for Wadi Rum Dream Camp – rated 9.3 by recent guests! The staff is super nice and welcoming . The price is really good . We had a great view for our room. The hotel provides a lot of activities like Jeep tour and camel rider with cheap price. The food are also great as well .The restaurant made special delicious thanksgiving dinner at night . Amazing setting in the desert. Great traditional food prepared by the staff. Great opportunities to tour the Wadi in 4x4 and camel. Easy transfer to/from Dream Camp as the staff picks you up at the visitor center. Comfortable bed. Very quiet. Amazing view of the stars at night. Good places to enjoy the camp in the shade under natural rock formations. 48 hours is optimal to really experience the wonder of this area. Strongly recommend. A perfect combination of camping and comfort. Fabulous food, friendly hosts, and real hospitality in a stunning location. The staff was incredible...very hospitable and funny from the moment we arrived until when we left. We felt very at home and comfortable and taken care of. It really exceeded our expectations! Plus, I had requested a room upgrade when I booked and they gave it to us :) Was a very nice surprise. Would highly recommend this property. We were only there one night unfortunately, but would have loved to stay longer. Abdullah picked us up and dropped us off at the visitor's center and he's amazing! Then we had Hassan as our driver for the sunset tour and he's amazing too! Can't say enough great things about this place. 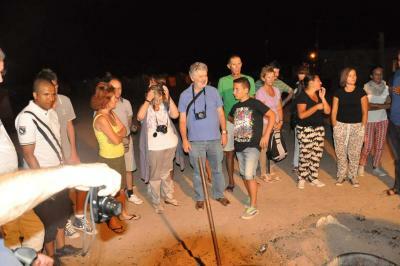 We also met some fantastic travelers while there, who became new friends. :) Thanks for such a great experience you guys!! OH I ALMOST FORGOT - the zarb (the dinner they cook in the ground) is enough of a reason to come here. One of the best meals of my life!!!!!! Man. Wish I was still there. Amazing sunrise! You have to request for it. The guide abdullah was very friendly. The place is just magnificent! Staff was incredibly friendly and welcoming. they went above and beyong my expectations. They arranged 2 hour horse ride for me and next day, even 3-hour jeep ride for a very reasonable price! Manager was incredibly friendly and welcome each of the guests in person. 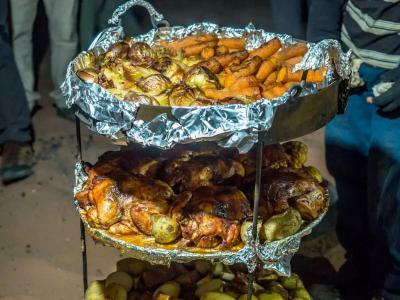 Moreover, they prepared a delicious and very yummy dinner, serving it in a very beautiful way! Stay in the Dream WR Camp was one of the highlights of my trip to Jordan. We liked the Dream camp very much. They picked us from the visitor center, communication was really smooth. The jeep safari they offer is a must, it was really fun. The dinner, as well as the breakfast was really good. They upgraded our room upon arrival (I guess they always do it as long as rooms are available). It was warm and comfortable, quite large as well. Overall, I recommend this camp to everyone. 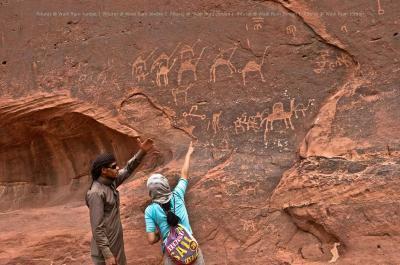 Wadi Rum Dream Camp is located inside the protected area of Wadi Rum. 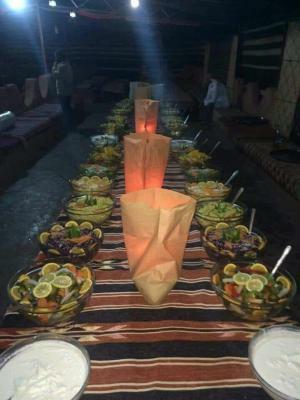 It offers traditional Bedouin experience and hospitality. Free WiFi is available throughout the camp. The tents are are furnished with beds, mattresses, blankets, pillows, linen and towels with shared or private bathrooms. The camp serves breakfast buffet and traditional meals for dinner. 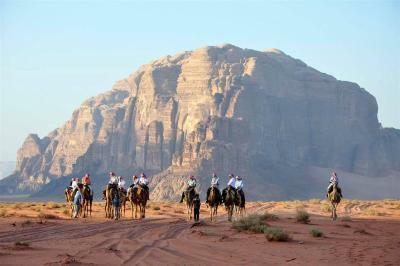 Wadi Rum Dream Camp provides desert tours including camel riding, horseback riding and jeep tours. Guests can also enjoy yoga classes and body massage at the camp. 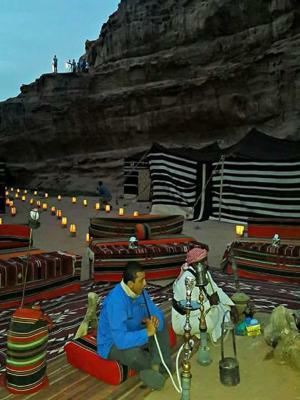 After a busy day, guests can sit around the fire pit and listen to traditional Bedouin stories and music. 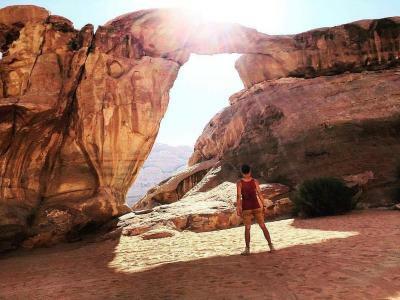 The nearest airport is King Hussein International Airport, 25 mi from Wadi Rum Dream Camp. Free parking is available. 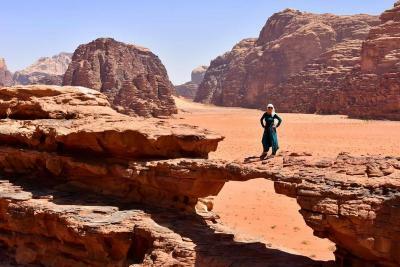 When would you like to stay at Wadi Rum Dream Camp? 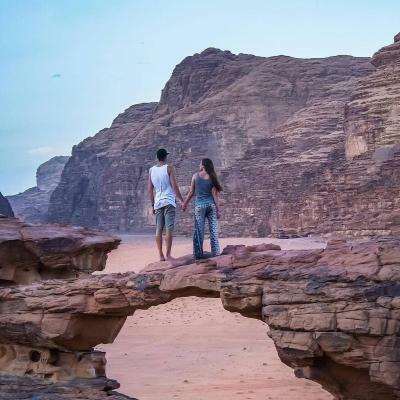 House Rules Wadi Rum Dream Camp takes special requests – add in the next step! Any additional older children or adults are charged JOD 35 per night for extra beds. Please inform Wadi Rum Dream Camp of your expected arrival time in advance. You can use the Special Requests box when booking, or contact the property directly using the contact details in your confirmation. The staff should mention the drinks for dinner are not included in teh price. Our stay was awesome. Would love to come back. Our guide Abdullah is a great person, nice and easy-going, just a perfect host. He upgraded our basic tent to a family one - wit private bathroom and a view! Thanks a lot for that! We loved the whole capm, organised perfectly. 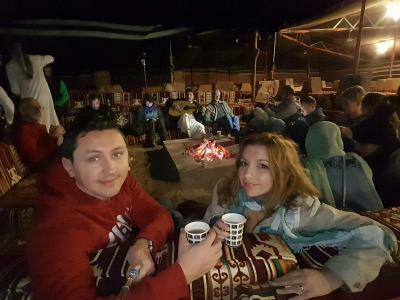 Delicious Bedouin tea, great dinner, we also had nice lunch (not inluded, 5 JOD per person). Took a jeep safari and a camel ride. You don't have to, but I think it's worth the money. All the staff is very nice, helpful and discreet. We found Jordan to be super welcoming, but this just takes the top spot. The staff went out of their way to make our stay a great one, the room was out of this world and the food was insane! Staff were so friendly, helpful and welcoming. Location was amazing, in a magical location in Wadi Rum. The room had u disturbed views of the beautiful desert landscape. Super clean rooms, camp area and bathrooms. The food was delicious and traditional. Tours and excursion options were excellent! I am already looking forward to coming back. Amazing! Must visit! My friend and I had a wonderful time here. Everything was perfect from the jeep safari, the dinner, the hospitality and it definitely exceeded our expectation when we saw the tent where we had to sleep. Beautiful landscapes and bathroom inside the "VIP" tent. The Dream Camp Team is really amazing, everybody is super friendly and helpful. Our stay was perfect from the moment we arrived to the Visitor Center - even though we didn’t ask, we were upgraded to the room with windows and the view was really out of this world! The room was super clean, food was delicious and we also did a 4-hours jeep tour with Hasan - special thanks to him for making the tour so nice. The camp really has very cosy vibe, we will definetely come back. We booked the dream camp over booking.com And Abdullah immediately started to comunicate with me via whatsapp. He picked us up at the visitor center And drove us to his camp, super Nice person! We felt like home, forgot the time and didn’t want to leave. It was so peaceful and the dinner was amazing!!! The evening next to the fire with talks and million stars! 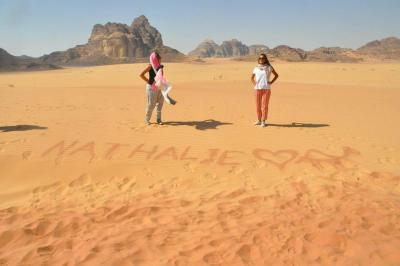 Wadi rum dreamp camp was one of the most special experiences i have ever had. Not only because of the amazing location but most of all because of the staff that make you feel like home. The food is wonderfull and people friendly and funny. 10/10 i would go back there! Some hot water to wash in the mornings would have made our stay perfect!